Can Kittens Eat Popped Corn? Popcorn and kittens should never meet. Although you may think of popped corn as being a healthy and harmless treat for yourself, that in no way means the same standard applies to the feline species, especially wee kittens. 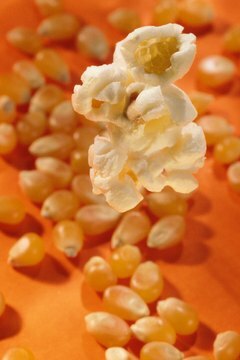 Although popcorn isn't toxic to pets, it poses the dangerous and frightening possibility of choking -- yikes. When it comes to putting together a nutritious and balanced meal plan for a kitten, automatically rule out all "people foods" before you even start. After a kitty is weaned off her mother's milk, it's important to focus on protein-rich foods that cater to the very specific dietary requirements of the little guys -- energy, energy and more energy. The needs of a kitten are very particular. For example, ample taurine for strong vision and sufficient fats for beautiful fur, according to the Virginia-Maryland Regional College of Veterinary Medicine. Essentially, a kitten's diet has no room for popcorn. Never allow a kitten to eat popcorn under any circumstances. Popcorn, like many other human foods, is simply not made to accommodate the demands of a rapidly growing kitten body. Although plain popcorn is not toxic to cats, that in no way means that it's safe, either. According to the ASPCA, the puffy white stuff can be a major choking hazard to your fluffball. Popcorn can in some instances lead to potentially dangerous blockage within a feline's throat, occasionally even triggering respiratory woes such as airway blockage -- not good at all. This type of blockage can be deadly to a small kitten, so make sure to always keep popcorn far, far away from her. If your kitten somehow got her paws on popcorn and appears to be choking, seek immediate emergency veterinary care. Choking matters can be a matter of life or death, so never dillydally. Popcorn often comes with cheese or butter toppings, both of which include milk, one of the biggest enemies of the feline diet. Kittens, just like fully grown cats, are generally unable to adequately digest dairy products. This lactose intolerance often causes an upset stomach in kittens -- think diarrhea, tummy ache, the works. Spare your kitten the discomfort. Keep her away not only from popcorn, but also from its various dairy-based toppings. Another much loved topping for popcorn is the classic -- salt. Sure, salt may seem like no big deal to you, but for kittens and cats, the stuff is seriously toxic, sometimes even fatal. If your cutie for any reasons consumes a little -- or a lot -- of salty popcorn, you may observe a lot of potentially harmful symptoms in her, including convulsions, exhaustion, diarrhea, throwing up, unusual thirst, loss of appetite and coma. Waste no time in getting your fluffball some emergency veterinary assistance if you observe any of these frightening signs at all. Do American Bulldogs Lose Their Hair? What Do You Do When Your Kitten Tries to Eat Objects? "After a Cat Has Kittens, When Will the Kittens Feed?"